Ahead of International Women's Day (8 March), the European Commission is reaffirming its commitment to tackle gender inequalities across the EU. According to new Eurobarometer statistics published today, a large majority of citizens (76%) believe that tackling inequality between women and men should be a priority for the EU. According to the latest Eurostat data, the gender pay gap remains stagnant for another year running - per hour women earn 16.4% less than men. The Commission's annual Report on equality between women and men, also published today, shows that despite some progress gender equality remains an unfinished business. "Europe cannot afford to underuse the potential of 50 percent of its population. Even though equal chances for women and men are more than ever becoming a reality, there is still a long way to go. 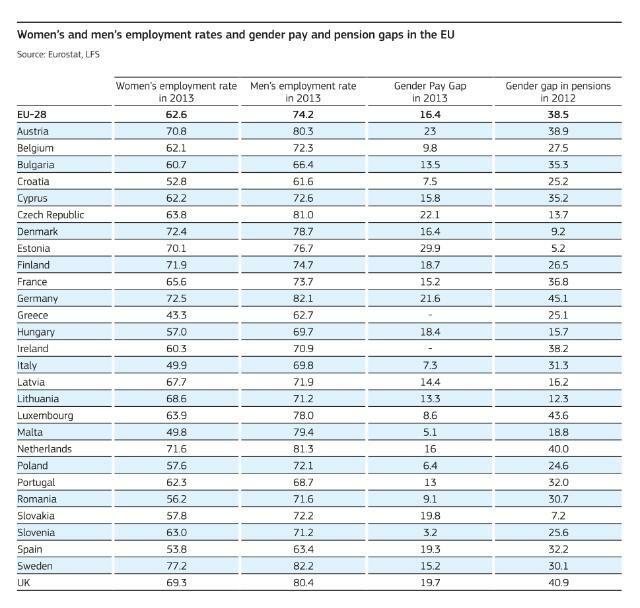 For every euro a man earns in Europe, a woman still earns only 84 cents. Women are still underrepresented in leadership both in business and in politics. And worst of all, one in three women has experienced physical and sexual violence. This is unacceptable. I am committed to addressing these challenges and to achieve tangible results." said Vĕra Jourová, EU Commissioner for Justice, Consumers and Gender Equality. Around nine in ten Europeans (91%) agree that tackling inequality between men and women is necessary to establish a fairer society. A similar proportion (89%) agree that equality between men and women will help women become more economically independent. Violence against women (especially sexual violence), and the gender pay gap are the two areas that the EU should address most urgently, according to 59% and 53% of Europeans respectively. For every hour worked women earn on average 16.4% less than men. This figure is above 20% in Czech Republic, Austria, Estonia and Germany. Closing the gender pay and pension gap has been frustratingly slow. The latter has reached 39 %. Women still tend to be concentrated in less well-paid sectors. Gender gaps in employment and decision-making have narrowed in recent years, but women still account for less than a quarter of company board members, despite representing almost half of the employed workforce (46 %). 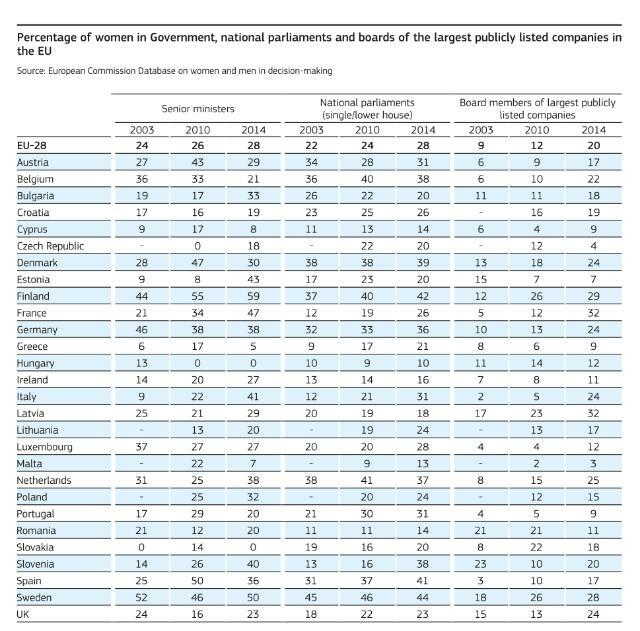 Also, the extent of gender equality varies substantially across Member States and has not reached all groups. Deficient work-life balance policies hamper women’s employment and therefore the potential for economic growth. Women are more likely to have a higher education degree (over 60% of new graduates are female), but are significantly under-represented in STEM studies and careers, in research and in senior posts at all levels of education, including higher education. The EU has supported specific actions, such as national governments’ campaigns against gender-based violence and grass-root projects led by non‑governmental organisations. (See 2014 Report on equality between women and men, chapter and adopted legislation and practical measures on victims’ rights (see MEMO/15/4465 and IP/15/3045) to protect women and girls from gender-based violence. All male members of the European Commission have given their support to the UN campaign #HeforShe aiming to make gender equality an issue for both men and women. This reflects the Commission's strong support for women's rights and women's empowerment. The #HeforShe campaign by UN Women calls for the more active engagement of men in the fight against such discrimination, since they play a pivotal role in changing the social norms that affect women. The Commission is also celebrating outstanding women entrepreneurs who have brought their innovative ideas to the market. On Monday 9 March, Carlos Moedas, Commissioner for Research, Science and Innovation, will launch the 3rd edition of the EU Prize for Women Innovators to give public recognition to three remarkable women and inspire others to follow in their footsteps. The Commission will continue its work with Member States, NGOs and stakeholders to drive forward gender equality at all levels, strengthening and consolidating the gains made in the past and meet the new challenges in the period ahead. The focus will be on "finishing the unfinished business" to close the gaps in pay, employment, pensions and decision-making, and to eradicate gender-based violence. The Latvian Presidency will table Council conclusions on the gender pension gap that will contribute to shaping a policy response to this issue. Legislative proposals such as the Women on Boards Directive or the Maternity Leave Directive must now be agreed in the Council by Ministers from the Member States as well as by the European Parliament in order to become law. Member States will also notify measures taken to improve pay transparency. This follows the Commission's Recommendation on Equal Pay Transparency giving Member States, for the first time, a toolbox of measures to tackle this issue. Science, technology, engineering and mathematics. The two broader fields of study grouped here are "science, mathematics and computing" and "engineering, manufacturing and construction".